We all make typos occasionally, right? We may have to deal with readers griping about a left-out apostrophe or some inverted letters, but generally speaking, there’s no harm done. Well, some typos are worse than others. 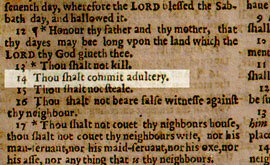 That was the lesson learned by printers Robert Barker and Martin Lucas in 1631, who win the prize for the most scandalous typo in history. No one knows exactly how many copies were run, but they destroyed as many as they could when the error was discovered. 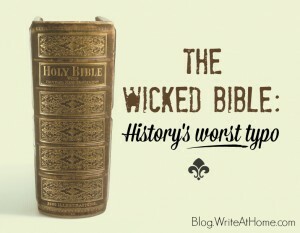 They didn’t get them all, however, as several editions of what has come to be known as the Wicked Bible, the Adulterous Bible, or the Sinner’s Bible still exist. One is in the rare books collection at the New York Public Library. Another is in the Dunham Bible Museum in Houston, Texas. In fact, you can own a copy. As I write this, a copy of the Wicked Bible is for sale at GreatSite.com for $99,500. I knew the time when great care was had about printing, the Bibles especially, good compositors and the best correctors were gotten being grave and learned men, the paper and the letter rare, and faire every way of the best, but now the paper is nought, the composers boys, and the correctors unlearned. Basically, what he’s saying here is, “Back in MY day, people CARED about the stuff they published. Kids today have no respect for the English language.” Sound familiar? Hast thou a comment to maketh? Leaveth it below! Wikipedia contributors. “Wicked Bible.” Wikipedia, The Free Encyclopedia. Wikipedia, The Free Encyclopedia, 30 Jun. 2014. Web. 8 Aug. 2014. Spelling Conundrums: Breath or Breathe? Lose or Loose? Thanks for the translation of the Archbishop’s statement. 😉 That does sound rather familiar.